It could, as someone said in Parliament, be a case of old wine in new bottles, but there are signs that the times are changing and it’s not all to do with politics and government. 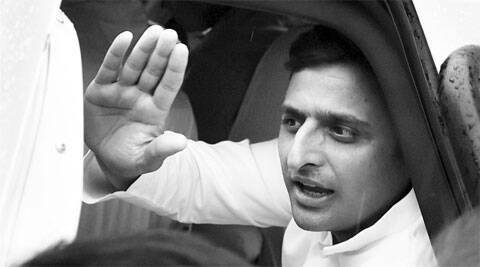 Akhilesh Yadav after meeting with the PM last week. The nameplate: Not Jhumpa Lahiri’s new book, but the mysterious removal and equally mysterious reappearance of L K Advani’s nameplate outside the office he has occupied in Parliament. The sign of the times or the terms of the sign are clear: The reinstated nameplate carries his name, but no designation. Speculation on what role Advani will play in the new dispensation is over. The nameplate says it all: he can be dispensed with. The junket: We now know what it costs to send six people to Brazil to watch the FIFA World Cup — Rs 89 lakh. That’s the money that Goa Chief Minister Manohar Parrikar has sanctioned to send six MLAs on a junket to watch football. That’s literally a penalty kick for poor taxpayers who are footing the bill. To add insult to injury, the CM justifies the trip as “a study tour”. That could mean studying figures on Copacabana Beach, but it surely deserves a red card. Cancelling the trip is an own goal. The tweet: Generally, Union ministers avoid criticism of actions supported by their own government. Not General (retd) V K Singh. The former Army chief has been trying to scuttle the next Army chief by a series of offensive moves, some which his own government found offensive; most notably his tweet accusing Lt Gen Dalbir Singh of protecting a unit that commits ‘dacoity’. Actually, V K Singh is the one trying to steal a march over his long-term rival, but by shooting off his mouth, or finger, the minister seems to have shot himself in the foot. The Americans call it friendly fire. UP and down: Uttar Pradesh seems to be ruled by rapists, with horrific incidents all over the state exposing the government’s helplessness and its attempts at a cover-up. The official ruler, Akhilesh Yadav, seems blissfully immune to criticism, hosting an investors’ summit and declaring that all was well. He needs to be reminded about the Emperor’s New Clothes, a fable about a ruler who walked around naked believing he was fully clothed. Quite appropriate under the circumstances. The Gujarat model: Ahmedabad is the new New Delhi, or the other way around, as everyone tries to replicate the Gujarat model at the Centre — from cleaning the Ganga to providing 24/7 power and education for all. Quite educative, since parts of the Capital have been powerless and our rivers are turning into deathtraps, but that hasn’t stopped hordes of bureaucrats from rushing to Ahmedabad in search of the elusive Gujarat model. They will return when they find it. Intelligence quotient: The conspiracy theory to beat all conspiracy theories, the Intelligence Bureau’s report on the threat to India’s national security and the Gujarat model by foreign-funded NGOs. The conspiracy was actually contained in the report which was taken verbatim from a speech made by Narendra Modi when he was the CM of Gujarat. They could have titled it the ‘Greenpeace Revolution’. Late edition: The early bird does not catch the worm, or so Urban Development Minister Venkaiah Naidu discovered on his 9 am round of the ministry. It was check-in time, but no one had checked in. Old habits die hard and we may yet see the honourable minister visiting bureaucrats’ homes to wake them every morning with tea and idlis. At least it might shame them into getting to work on time. 2 Out of my mind: Who’s afraid of Hindutva?